I started grilling fruit a couple years ago, and must say that I've been addicted ever since. It's quite a healthy addiction really - and has often given me the urge to grab a fresh peach instead of that slice of chocolate cake. Fruit, which are full of natural sugars, become incredibly sweet and candy-like when grilled. The outside becomes caramelized (especially with the addition of a dash of sugar) and the interior softens and almost melts in your mouth. I've presented it here very a simple mint garnish and a little brown sugar, but it also tastes wonderful with a scoop of vanilla bean ice cream, or thick lemony yogurt. Place your grill on medium heat. Sprinkle the brown sugar over the cut peaches. Grill the peaches (1-2 minutes on each side). Don’t move the peaches around during that time to make sure to get nice grill marks on each side of the fruit. Remove from the heat and let cool for a couple minutes. Place in your serving bowl and add the coarsely chopped mint. Oh my goodness. You just elevated my favorite fruit to another level. Looks great! Its awesome & I love my fruit this way. What a simple & beautiful dessert! I learned about you via Tastespotting's email, and I'm so tickled to find your blog. The pictures are remarkable! The ideas inspiring! Will be grilling fruit ASAP, thanks to you. Aren't those peaches divine?! Oh wow, I can't wait for peach season! I haven't tried them grilled because I have a hard time making them last long enough to get to a grill! 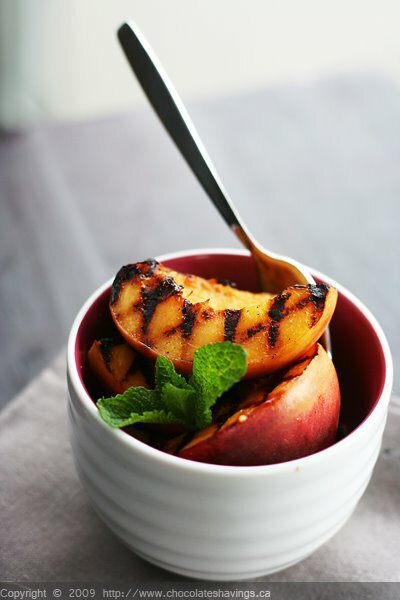 I've grilled a pineapple before and now I'm looking forward to grilling peaches - what a great idea! I'm so glad you decided to pay homage to grilled fruit! It is truly one of nature's delicacies!! I especially love grilled peaches (although grilled pineapple is a close second). These look just fabulous! I don't get it, aren't you in Montreal? Where are you finding quality peaches (please I am dying for anything other than oranges right now).... or is this from the past and you are reminding us that better weather is coming? Beautiful grill marks, a simple dessert. I would love a dollop of whipped cream - that is all. That sounds like a wonderful way to prepare fruit indeed!! Can I ask if you used a grillpan? I love the flavor of grilled fruit and how the natural sugars just carmelize. These peaches look fresh and delicious! I just starting grilling my veg and now I can't wait to gril my first fruit! Looks delicious..Love the charred bits! Completely agree with you. Such a wonderful flavor in salad, with grilled meat, or like you've presented it. Nice. I'm just getting my husband (a great griller) started on fruit--and this is perfect! Thank you! Oooooh - that looks fantastic - I can't wait for summer!! Coco Bean: I was lucky to get really good peaches here the other day, but was mostly testing out recipes for spring/summer... oh the irony of working in the food business and coming up with grilling recipes when snow is still on the ground! Do you work for yourself or for a company? I bet it is hard to find certain food in season eh! What a gorgeous photo! This would be absolutely divine with the aforementioned yogurt! YUm! This looks amazing!!! The colours are perfect and the photo too! I must try more grilled fruit this summer! Where'd you get those gorgeous peaches! Mine here are all wimpy looking! Gorgeous pic! What a fabulous photo! Delicious. Great photo of the grilled peach!! I grilled some peaches up last year for the first time and really enjoyed them. Wow... I'm in awe. You grilled the fruit to perfection. Can't wait for summer season to start using my barbecue. mmmm. i'm all about grilled fruit these days. also, have you tried blow-torching fruit?? i've been trying it on mangoes with mixed results. Definitely a recipe I'll be trying! I was looking around for something wonderful to do with peaches and found you at tastespotting. Just wanted to tell you what a gorgeous photo you've got!